Oeuvres des Dubut features the works of the two Dubut, father and son. 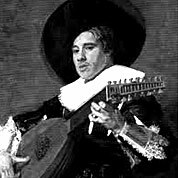 Their music span the years from 1638 to almost the end of the century, thus taking us through the height of the French Baroque period to the decline and eventual disapperance of the lute from the French Music scene. Oeuvres des Dubut / édition et transcription par Monique Rollin et Jean-Michel Vaccaro. French Baroque. Time signature 4/4. 2 pages. 19 measures. Provided by Lef Jack.